With excellent road links from the M5, M4 and M32, and over 10,000 parking spaces in central Bristol, travelling to the heart of the city by car is straightforward. Enter BS1 3DX into your Sat Nav and you’ll find us without a problem. Click HERE for details of current transport plans and projects. The car park has over 2,500 car parking spaces available for customers, 24 hours 7 days a week. Parent and child parking spaces can be found on the ground, second, third and fourth floors. Disabled parking can be found on the ground and third floors. There are 12 charging points for electric cars situated on the ground floor. For prices and opening times visit the Cabot Circus website. There are several NCP car parks within very close proximity to Bristol Shopping Quarter, including Nelson Street, Lower Broadmead, Rupert Street, and St James Barton. Each one has four charging points for electric cars. For prices, opening times and locations, please visit the NCP website. Special offer – pre-book to park on a Saturday or Sunday at any of NCP’s six city centre car parks and pay just £5 for four hours. Find out more HERE. Homeless charity Emmaus Bristol offers five parking spaces on Backfields Lane, BS2 8QJ through Just Park from just £5.70 a day. The spaces are just a few minutes walk from Cabot Circus, and everything the charity makes through parking fees goes to help people out of homelessness. wheelchair accessible vehicles. Telephone 0117 403 2798 or book online. There are four taxi ranks in Bristol Shopping Quarter, one on Union Street (by the Odeon Cinema) two on The Horsefair, and one on Penn Street. Click HERE to see their locations, and others around the city centre. 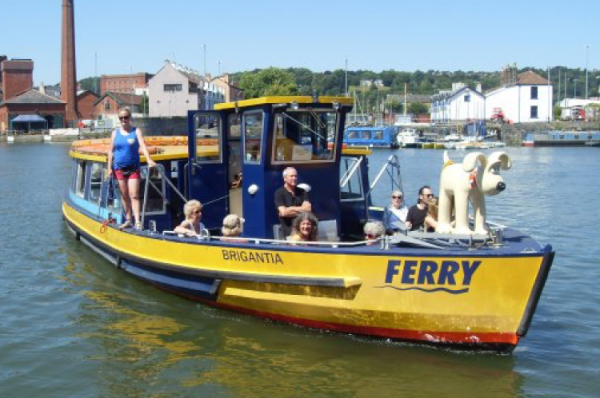 From Temple Meads, Hotwells, and 14 other landing stages dotted around the Floating Harbour, take a Bristol Ferry to Landing Stage 15 (Castle Park) from where it’s a short walk, across Castle Bridge and through Castle Park, to Bristol Shopping Quarter. Click HERE for the timetable. More than 1,000 buses come into Bristol Shopping Quarter every day – making it the easiest way to travel. Use the First Group website to find timetables for your nearest bus service that travels into Bristol Shopping Quarter. Metrobus offers faster, more frequent and more reliable services with direct routes to key destinations. It uses new, modern, environmentally-friendly vehicles with USB sockets and free Wi-Fi. The buses have an extra pair of doors to speed up getting on and off. It’s a ‘buy before you board service’ with ticket machines at every stop, for quicker journeys. The m1 metrobus service runs from Cribbs Causeway to Hengrove and calls at Broadmead, the city centre, Bedminster, Inns Court and Hengrove. The m2 serves serves Long Ashton Park & Ride, Ashton Vale, Ashton Gate, Cumberland Basin, Spike Island, Redcliff Hill, Temple Meads, Cabot Circus and Broadmead. The m3 links Emersons Green, Lyde Green Park & Ride, Bristol and Bath Science Park, UWE Frenchay campus, Cabot Circus and the city centre. Bristol Bus and Coach Station is located on Marlborough Street, approximately 5 minutes from Bristol Shopping Quarter. National Express operates many services in and out of Bristol, connecting the city with destinations around the country and runs regular services to and from Gatwick and Heathrow airports. Megabus, connecting Bristol with towns and cities around the country, picks up and drops off on Bond Street. Snap works with the country’s top independent coach operators, to put on the trips their customers want, where and when they want them. Unlike traditional companies who operate a fixed timetable, they can concentrate all their trips at the times people most want to travel. So they don’t have to charge the earth for them and even have a price match guarantee. If you find a better price on an equivalent trip they will simply refund the difference. Use code brisshoppingq to get 25% off your first trip. The city’s coach park is located at Bristol Fruit Market where there are marked spaces for up to 20 coaches but room for more if there is demand. The site has 24-hour security and facilities for drivers, including an on-site café and toilets available. There is also plenty of choice nearby with the city centre just a short distance away as well as the Paintworks development, Avonmeads Retail Park and other local attractions. Drivers MUST book their coach parking in advance by telephoning 0117 9771655 (24 hours) for £12 for up to 24 hours parking. Bookings can be made up to a few minutes before arrival. Please note the coach park is unsuitable for passenger pick-up or drop-off. For more details about Bristol’s Coach Parking facilities including drop-off and pick-up points, go to the TravelWest website HERE. From M32, junction 3 via St Phillips Causeway (A4320) and then south on Albert Road. From City Centre via Bath Road (A4), turning left over the river at the traffic lights approximately 300 metres past Three Lamps Junction and then right onto Albert Road. Walking and cycling into Bristol Shopping Quarter is a simple, stress free alternative to using public transport or the car. There are many cycle racks within the area and comprehensive information on cycling routes on the Better By Bike website. You’ll find a great walking map on the Visit Bristol website. You’ll probably spot some distinctive yellow bikes parked up around the city, they belong to a great app-based bike rental scheme, the first of its kind in Europe. Prices start at £1 an hour. Visit yobike.co.uk to find out more and to download the app. Bristol’s three Park & Ride services offer a comfortable, frequent and easy way to travel into Bristol without the stress of city centre driving. Remember it is free to park, you simply pay for your bus fare. Visit the Travelwest website for more details. When you arrive at Bristol International, make sure Bristol Shopping Quarter is your first destination – why not jump on the International Flyer coach which goes directly to the bus and coach station – just 200 metres from the shopping area. For all up-to-date travel information, visit the TravelWest website.